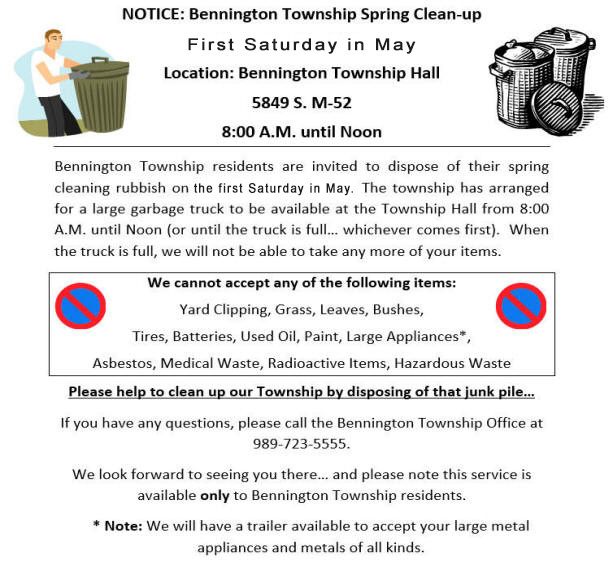 Bennington Township residents are invited to dispose of their spring cleaning rubbish on the first Saturday in May. The township has arranged for a refuse hauler to be available at the Township Hall from 8:00 A.M. until Noon (or until the truck is full… whichever comes first). When the truck is full, we will not be able to take any more of your items. Please view the specifics below. PLEASE NOTE: We cannot accept trees, branches, & brush. The landfill will not accept them. Click here for a copy of the above flyer in pdf format.